You are here: Home / Vegetables / What’s Eating My Jalapeños? You’ll never believe what I found eating my jalapeños. 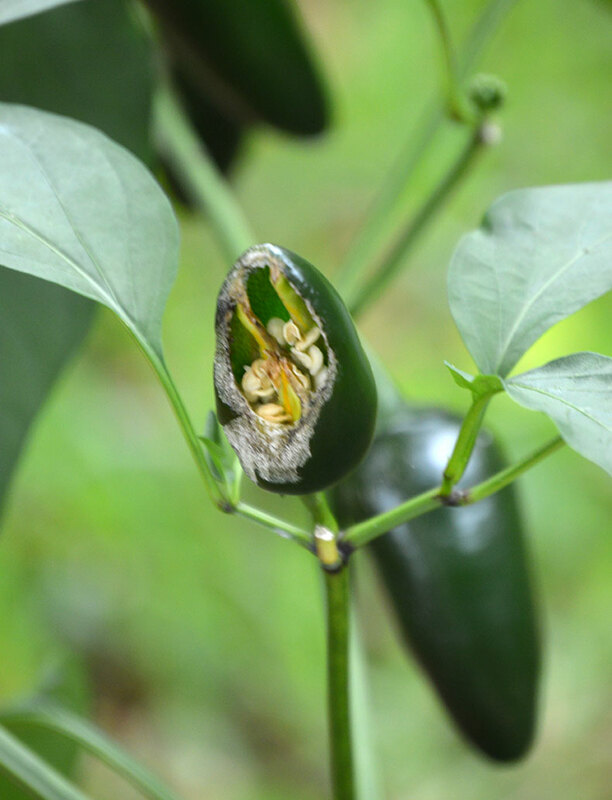 It’s a hot pepper so you would think that it would be protected from hungry critters. But, that is not always the case. I planted my jalapeño peppers in containers this year. They were grown in part shade just along the edge of my driveway. I have four plants and they are growing 10-15 peppers each thus far. I picked my first batch of peppers this weekend to give to a friend. As I was picking them Saturday morning, I noticed that there were were two of them that appeared to have been chewed on. Now you would think that a hot pepper has enough chemical protection to avoid getting eaten, but obviously that is not the case. After looking around the plant a bit, I discovered this huge guy hanging around as still as can be. You may recognize him – but you would normally expect to see him on your tomatoes. He’s obviously been feasting because he is huge! Since these are container plantings and I have not grown peppers in them before, the obvious question is how did these worms get there? Tomato hornworms are the larval stage of the tomato hornworm moth. These brown colored moths will lay eggs on plants in early spring and the caterpillar will begin to feed after hatching in about a week. The caterpillars feed for several weeks (they are voracious eaters – I have seen one worm strip an entire tomato plant) before creating cocoons in which they will spend the winter. In the spring, the moths will emerge and start the process all over again. 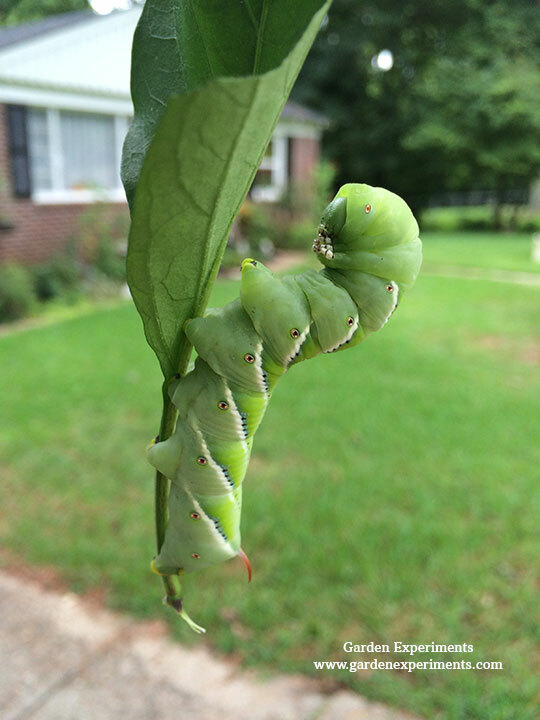 The obvious sign that you have hornworms are leaves, stems, and fruit that appear to have been chewed on. There may also be caterpillar droppings on the leaves of the plant – so keep an eye out for this telltale sign. The caterpillars are green which is excellent camouflage, so check the underside of your leaves carefully to find them. I often look for leaves that are stuck together or drooping in an unusual way. The weight of these caterpillars will often give them away. I don’t use chemicals in my garden if I can help it, so the way I took care of these worms was to find them, remove them, and toss them on the concrete for some lucky bird to eat. You’ll need to inspect the plant carefully and probably frequently to make sure that you got them all. To prevent any of the larvae that may have already gone in to the cocoon stage from becoming next year’s garden pests, be sure to till up your soil each year before you plant. The caterpillars make their cocoons in the soil, so this will kill them before they have a chance to hatch. If you find a tomato hornworm that looks like this one does, it has been parasitized by the larvae of a wasp. 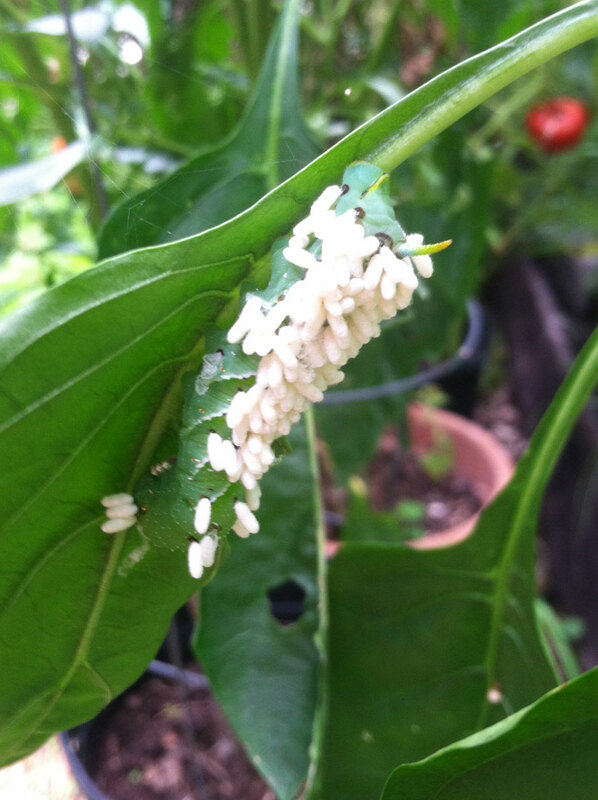 The wasp larvae will eventually kill the hornworm. These worm larvae are nature’s pest control. 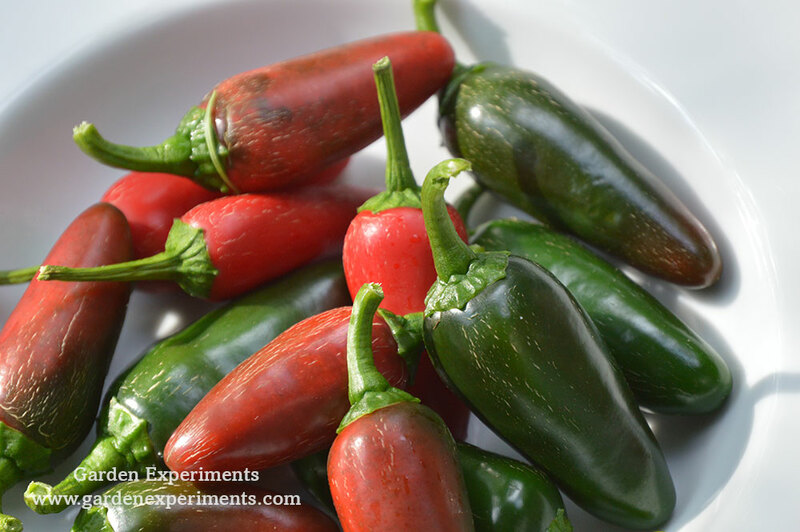 Regardless of the caterpillars, I was able to harvest a good amount of peppers for this first picking and I look forward to more soon!